A mysterious, enigmatic ancient race of entities that inhabit semi corporeal bodies on this world and where somehow cut off from their home world. The Masquari believe it is their mission to protect this world from devastation. And they have seen a lot of it. They are vigilant observers of the races and know when to step in to save them from a terrible fate. They believe that once they have completed their task and helped this world and its races they will once again be reconnected to their home world and will be free to go back. Inquisitive, enigmatic, stoic and sometimes macabre the Masquari act as self appointed peacekeepers for this world. They are intelligent and formidable. Their knowledge is vast and their wisdom is sharp so they have a keen sense for things. They are adherent to an outcome and will not rest till a matter is settled. There presence is met with mixed reactions, as some see them as helpful and some as a nuisance. A Masquari is really more then they appear to be. They stand around 6’–7’ tall. They are always wrapped in heavy dark garments and hooded cloaks, knee high boots and gloves. They sometimes have strange shoulder guards and always wear snow-white masks with bizarre stoic faces engraved on them. Masquari must stay covered for their bodies are not completely corporeal and the multitude of garments helps to encase their energy. They are very imposing to see and yet this juxtaposes with their very fragile natures, as they are not completely solid. Masquari are not like regular races. Each Masquari is a face of a much vaster consciousness. This consciousness or Collective is made up of a multitude of Masquari beings. Their essence is connected into one mind, one consciousness. Each masquari is a connected to the collective and an individual which is physically separate from the Collective and can act and move on its own but still maintain a very strong mental link to the Collective. The Collective experiences everything the Masquari does. These individuals have free will, but know their true purpose is to serve the Collective’s highest good. Masquari are not completely physical, under their garments they still are part energy and it takes years for them to increase their physicality after they are Reborn. As the individual continues to become denser his link with the collective fades. The Masquari is then brought back usually every 50-80 years. They must return to their lands in order to perform a ritual, which will shift them into a non-corporeal form and rejoin the Collective. Once their rest period is complete the Masquari are then reborn in another ritual that rematerializes them. Very rarely a Masquari will completely separate from the Collective. At this point the Masquari becomes completely physical and requires food, water and normal rest and gains all the other trappings of a material body. They loose 2pts of wisdom and must deal with the loneliness of being just one consciousness and become used to the sense of being an individual. These Masquari are well over 100 years old. Since the Masquari have been around for so long they have picked up many powerful abilities, skills, feats and this knowledge is fused into the Collective, every time a Masquari returns to Rest. All this knowledge is housed in the Collective. When a Masquari is Reborn he is granted but a fraction of knowledge, enough to make his way in the world, for a reborn is not strong enough at that first stage to access or acquire additional knowledge. 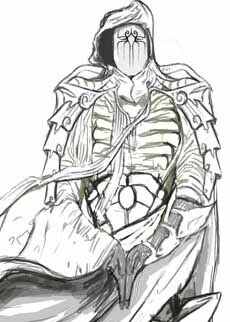 As a Masquari becomes more corporeal they can then access additional knowledge and draw added Essence from the collective. Essence is what allows the Masquari to become physical. It creates an energetic framework for the consciousness to be housed. As Masquari become more corporeal they can use additional Essence to essentially download or acquire the understanding and information of how to use specific abilities, skills or feats. Once the individual Masquari has acquired it, they will remain with them for the entire time they are physical. Masquari can only expend so much Essence each level to acquire new abilities, skills or feats. The Masquari view the humans as dangerous children who have not come into their ability to handle their power. They realize that they are a very adaptive race but do not seem to have any awareness of how they effect everything around them. They are protective of the Daemolen and hope to use their assistance for the time they are here. They view the Nasir as curious creatures but often dismiss them as overly superficial. They have a long history with the Eliquin and pull on their resources but don’t understand their aloof attitude towards them. The Masquari live in the western part of the continent buried deep behind the dark forests and bordered north by the a mountain range and the coast. There they construct brilliant citadels of gleaming stone and quartz. These citadels are dedicated to reverence, meditation and planning. As the Masquari keep an ever-watchful eye on the world. Deep within their main complex, with in a stunning vault you would find the Masquari Collective. The Masquari believe they are a “grounded” race of entities that will someday join the rest of their race when they complete their “mission” here. They derive their spiritual sustenance from the Collective, a pooled consciousness of their fellow Masquari in “rest”. Masquari gain the ability of Tongues and can speak the language of any race. Incredibly Intelligent, wise and light of foot, however their fragile natures show through as they are not very strong or hardy. Medium: As Medium creatures, Masquari have no special bonuses or penalties due to their size. Masquari based land speed is 40 feet. Being lighter physically, allows them to move more quickly. Resistance to magic & psionics: Masquari gain spell resistance/power resistance 5+HD. Being comprised partially of energy and being linked to the Collective allow them to have special resistances. Dark vision: Masquari can see in the dark up to 60 feet. Dark vision is black and white, but it is otherwise like normal sight, and Masquari function just fine with no light at all. Outsider type: Masquari’s soul and body are one, when one is slain it returns to the collective to be reborn again. They are not affected by spells targeted at humanoids and are immune to charming. Tongues: This spell like power grants the Masquari the ability to speak and understand the language of any intelligent creature, whether it is a racial tongue or a regional dialect. The subject can speak only one language at a time, although it may be able to understand several languages. Tongues does not enable the subject to speak with creatures that don’t speak. The subject can make itself understood as far as its voice carries. This spell does not predispose any creature addressed toward the subject in any way. Immortal Beauty: The Masquari are corporeal beings of an alien race. This races comeliness is very high and most of the Masquari choose similar forms. Faire Fire: Their body’s glow with a greenish light, they channel energies through their being to keep them materialized. This energy is known as their Essence. Disguise: The Masquari learned that their normal appearance could be quit offsetting to the natural races of this world as well they needed a sort of shell to help them encase their Essence. They must cover every inch of their bodies to conceal their magical light and immortal beauty. They are always seen wearing cloaks, full leather body armor, high boots, gloves and strange white masks. They also can wear elaborate shoulder guards and headdresses. Their facemasks are elaborate works of art and are often painted with enigmatic expressions. They tend towards dark colors as to help hide their luminosity. Collective Sustenance: The energy from the Collective sustains the Masquari and they do not require food or water. They can consume them however and it does help them to feel more physical. Immune to disease both magical and natural & sleep spells/ powers. Masquari do not need sleep, but they must go into a deep meditative state where they can connect to the Collective at least 4 hours every day. The Masquari are Reborn fully mature. Age is representative of physical chronological age after being Reborn. After a Masquari is Reborn they spend the first 10 years within the Homeland adjusting to being physical and refining their connection to the Collective. Masquari wear specially crafted outfits that include special leather armor, boots, gloves and heavy hooded cloaks. The AC bonus is +4. These items can be magically enchanted. Masquari have a difficult time wearing normal armor and must get it custom tailored for them. They can do this themselves with a proper craft arms/armor skill.